Looking for an easy entry into snow sports that doesn’t involve you tumbling down the slopes in a tangle of skis and ski poles? Snowshoeing is the perfect option for the skittish snow sports enthusiasts (or the clumsy ones!). And there’s no better way to start then getting a good pair of snowshoes, the proper attire and setting out trekking through that powder. You can even go climbing and running in snowshoes! Or, grab your snowboard and set out on a backcountry hike for some fresh, untouched powder. Snowshoeing is actually pretty easy – and much more fun than struggling to take steps in your trusty snow boots. So get off the sidelines and prepare to set out for a bit of hiking through the snow covered landscape without having to worry about sinking in snow drifts or taking a tumble. If you’re ready to experience the awesomeness of snowshoeing in freshly fallen snow, then let us help you find the right pair of snowshoes for your winter trekking adventure. What Shoes Can I Wear With Snowshoes? Should You Buy Used Snowshoes? Unlike skiing and snowboard, you don’t need to take any lessons to learn how to walk! Going snowshoeing is an easy winter sport to learn and the gear is cheaper than other winter sports, which makes it the most inexpensive winter sport option right now. And compared to other winter sports, the risk of injury is very low. Plus, it’s a great away to stay active when there’s snow on the ground. If you’re looking for a great way to stay fit or lose weight, then you might be interested in knowing that you can burn 600 or more calories per hour snowshoeing. It’s a great cardiovascular workout and Snowsports Industries America (SIA) says that you can burn more than 45 percent more calories than walking or running at the same speed. If you’ve ever been out in the snow, especially the fresh powder, then you know it can be a real struggle to walk through it. This is even more true when you’ve got several inches out on the ground. But when you’re wearing snowshoes, it’s almost magical because you don’t sink in the snow when you walk on it. And walking is no longer a struggle! By design, snowshoes spread your weight out to give you “flotation” on the snow’s surface. This cool ability means that you can easily hike and walk through the snow. You can even run with snowshoes on without the difficulty you’d expect with snow boots. Flat terrain is the type that is the best for a beginner to snowshoeing. Think of this as your entry level snowshoe type. The ideal conditions for wearing flat terrain snowshoes are flat to light rolling terrain, and these are designed for walking. This is the perfect type for beginners, casual snowshoers, and families. This type of snowshoe will have easy-to-adjust bindings and less aggressive traction systems. Rolling terrain is the type that is good for those with a bit more experience at snowshoeing. This type of snowshoe is ideal for backpacking and hiking. You can wear rolling terrain snowshoes for hiking on rolling to steep terrain off the beaten track. But never try to wear these on very steep or icy terrain. You’ll notice that this type of snowshoe has more aggressive crampons and beefier bindings than the flat terrain models. Mountain terrain is the type for the most experienced snowshoer, who expect to be on icy, steep terrain. So, in this category we have backcountry snowboarders, mountaineers, and advanced winter hikers. If you’re going to be off making your own path through this type of terrain, then definitely opt for this style. Mountain terrain snowshoes have climbing-style crampons and rugged bindings that can withstand harsh conditions and terrain. Note: you can also find snowshoes designed for running/fitness known as racing snowshoes. These are designed for easy control and speed. And the bindings are designed to fit athletic shoes. The basic rule of thumb for snowshoes is that heavier people need more snowshoe surface – plus, more snowshoe surface is necessary for drier and lighter snow. And you absolutely need to be certain you have the correct size in order to get that right amount of flotation. But you should always try to wear the smallest size that supports your weight on whatever snow conditions and terrain you’re going to be on. This is because the smaller shoes are so much easier to deal with compared to larger ones. Just make sure you don’t go too small because you still need good flotation. When you’re looking at sizing options, you’ll notice that sizes vary based on aluminum frame and composite models. Aluminum-frame snowshoes come in multiple sizes, usually 8″ x 25″, 9″ x 30″ and 10″ x 36″ or something similar. As you can imagine, there is a lot of thought that needs to go into which size snowshoes are the best to meet your needs. You can shop for size based on your gender and/or age, based on the terrain and snow conditions you expect to trek on, or based on how much weight you’ll be carrying on your trek. Let’s look at each option to give you a better idea of what to consider. Women’s snowshoes are designed to fit women’s footwear. As a result, they are designed with women’s smaller feet in mind and feature narrower, more contoured frame designs and sizes down to 8″ x 21″. Men’s snowshoes are designed to fit men’s larger footwear, in addition to heavier loads. Also known as ‘recommended load,’ the carrying capacity refers to the amount of weight you will be carrying while you’re out wearing your snowshoes. So, if you’re out backpacking or backcountry snowboarding, then your recommended load will include all of that equipment you’ll be carrying on you. If you’re going to be carrying a lot of gear, then pay attention to the recommended load or carrying capacity for the different snowshoe lengths. Keep in mind that recommended loads are based on based on light, dry snow conditions. Know the type of snow that you’re going to be walking on before you buy your snowshoes. For compact, wet snow, you need smaller snowshoes to stay afloat than you would for powder snow. If you go snowshoeing a lot, you may end up discovering that you need a pair for each type of snow condition. Open terrain where there are deep drifts means larger snowshoes are needed. Icy or steep terrain means smaller snowshoes are easier to manage. Forest, brush, or packed trails means you may need to maneuver in tight spaces, so look for small, compact models. Fresh, loose powder means that larger snowshoes are needed to stay afloat. 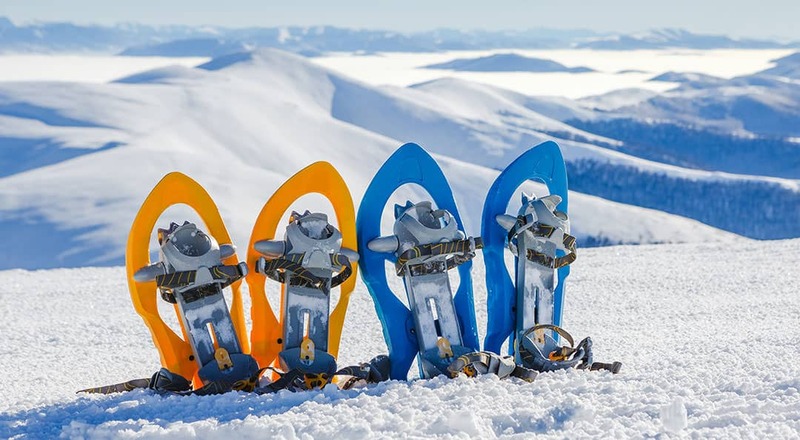 Now that you know about the sizes and types of snowshoes that are out there, let’s dig in a little deeper to learn about the differences in components that you will notice when shopping. As mentioned earlier, composite and aluminum frames are what you will come across. The composite frames feature an integrated hard decking material. This type of frame has been made popular by MSR, which is why you might have heard of it before now. On a composite frame, you can attach an up to a 6″ tail to shoe for extra flotation in deep powder. Aluminum frames are most common on snowshoes and they typically have synthetic decking. This type of deck usually has nylon or Hypalon rubber, which results in them being light and responsive out in the snow. Rotating bindings, which are also known as floating bindings, pivot at the point where they attach to the deck. This point is located under the balls of your feet. The benefit of this design is that lets you move naturally when climbing hills and walking. Pivot amount varies by model, which some pivoting more than others. In fact, there are some models that are attached with metal rods and pivot 90 degrees, or more. We’re big fans of this feature because it reduces leg fatigue since it results in the tails of the snowshoes (the ends) to fall and shed snow as you walk. It also helps you to steer (or track) better in deep snow. The downside to rotating binding is that it’s not as easy to back up or climb over obstacles in your path. Fixed bindings obviously don’t give you much pivot, and they’re connected with heavy-duty rubber or neoprene bands. Since the tail of the snowshoe comes up with each step when you have this type of binding, backing up and stepping over logs and other obstacles is easy. You get a comfortable stride with these. However, you do end up with more leg fatigue and you since they throw up the snow as you walk, it does kick it up on the backs of your legs. To ensure that your feet get a good grip on the terrain as you walk, all snowshoes have some traction devices on their bottoms. That traction is provided by cleats or tooth-like crampons. As you might expect, flat terrain models offer the least amount of traction while mountain terrain models have the most aggressive traction. Toe or instep crampons – these are the main traction source for any snowshoe. They’re found on the undersides of the bindings. As you walk and climb, they pivot with your feet and dig in to the snow. Heel crampons – these are commonly seen on the decking undersides snowshoes. Typically in a V formation, they work by filling with snow and slowing you down as you descend. Side rails – also known as traction bars, these are found on the decking undersides of the shoes. They give you lateral stability and reduce side-slipping as you cross slopes. Braking bars – you’ll find these integrated into the undersides of plastic-decking snowshoes. They give you forward traction and prevent backsliding. Heel lifts – also known as climbing bars or Televators (on MSR models), these wire bails can be flipped up under your heels to relieve calf strain on steep uphill sections and save energy on long ascents. This gives you the feeling of walking up steps and prevents exaggerated calf and Achilles strain. The bindings on snowshoes are designed to work with pretty much any type of boot, from hiking boots to snow boots to snowboard boots. You should choose a boot that will keep your feet warm and that will give you good ankle support while you’re out trekking on the snow. Look over the frames for any damage. Avoid those with chips in the frame. Inspect the bindings for overstress. Look for holes and rips in the flotation material. We definitely don’t want you to end up far from home or in the backcountry with faulty snowshoes, so please buy new snowshoes if you can. And give used ones a VERY thorough inspection if you can’t afford a new pair.